Also, arena mode is seriously fun. Random draft pick on your deck means that it's a very even playing field. I'm also a huge fan of the ARENA vs regular play but I'm always up for fun games. I've played a few games with Poe, it's been fun. I've built a customer priest deck that I've won a few online matches with, but that is the extent of my deck building. You should check out arena mode. It's a fun way to earn cards without having a good deck. It's a draft pick mode, where you choose one of 3 random classes, and then draft cards to build a deck. Your opponents do the same thing, so you're on equal footing. There's an entrance fee of 150 gold (or 50 gold more than a cardpack.) You're guaranteed to win a cardpack, and if you can win at least 3 arena matches, you break even with a cardpack and about 50 gold worth of winnings (and some dust). The more you win, the better your prizes at the end, including ever growing amounts of gold and dust, and rare cards. You're out once you lose three times. At 7 wins you're gauranteed a cardpack -and- 150 gold, so if you can consistently win 7 games, you can play arena forever without ever having to earn more gold. I've grandmastered twice so far (9 wins before it retires you) and have managed to be consistant with 4-6 wins per attempt, so for the most part, between Arena and Daily Quests I never really am not playing Arena. It's great. Silence is so damn powerful. I wasn't sure exactly what silence did, until I started using it. It removes the text from a card, reducing it to just its base stats. Enraged troll? Silence gets rid of that boost, making it a weenie. Windfury? Nope. TAUNT? Nope, just run right past him. So many goddamn uses, silence truly is golden. It's an amazing win button when you opponent thinks he just stopped your horde with a fat taunt character and he thinks you're all out of creature elimination. A cheese deck that currently has about an 80% win rate is a Shaman Charge deck. Load up on heavy hitting charge characters, have windfury cards to grant them windfury, have spells like +3attack or Berserk and as long as you can keep their taunters off the field you can finish them in one turn with no way for them to retaliate. Also, what DOES windfury do? [DOUBLEPOST=1382928680,1382928508][/DOUBLEPOST]I've also found Mind Vision to be curiously useful. It has such a low mana requirement and if you really luck out, you may get an Assasinate or backstab from that rogue you're playing against. Windfury gives a minion the ability to attack twice. That means that something that was a 5atk creature suddenly does 10dmg. Now pair that with other Shaman abilities like +3atk and suddenly a 5dmg becomes 16dmg in an instant. Wow, screw Counterspell. Screw it straight to hell. When a secret is in play, you have to play very carefully. Don't attack with your biggest minion right away, send a smaller one to see if it sets off the secret. You have to try and scout for the effects. Pretty much, once you learn what the secrets are, you can try and trick them out. EX: Mage secrets usually are -Copy Minion- (That creates a copy for the mage of the next minion you cast) -Counterspell- (Counter the next spell you cast) and Ice Block (If the mage takes damage to kill them this turn, they become immune). When secrets are around, you have to play low cards first to try and trigger the -trap- then continue with your strategy. Secrets in itself is a mind game strategy. If you think Mage secrets are bad, wait till you play a seasoned Hunter. Don't forget Vaporize, destroy the first minion to attack the mage. I'm pretty much focusing on my Priest deck right now. As of today, I am officially... LORD OF THE ARENA! Seems like Priest builds with mostly taunt minions are the current thing. My only loss was to a priest that managed to draft the perfect priest deck. I've learned a lot so far. Taunt is nice to have, but it isn't as important as I used to think it was. Priests are just really powerful because of all the buffing they can do. They shut down other common decks pretty hard. I haven't played a whole lot of constructed, my decks are all still kinda puny and missing a lot of core cards. That's why I've been playing Arena. I haven't ventured into the Arena yet. I've been just using the play option. What annoys me is that I'm using my not fully unlocked decks and it matches me with someone with, like a level 15 character with a custom deck and I'm playing with a level 2 hunter. I decided that I'll only play against the computer to fully unlock my decks. I did go ahead and buy a pack of cards, so I do have some rares. If you don't know how the arena works, check it out. It's a great way to earn cards, and the playing field is even for both teams. The way it works is that you pick one of 3 randomly chosen classes, and then pick one of 3 randomly chosen cards again and again until you've drafted a full deck of 30 cards. You then play against others that have done the same thing, and keep going until you either lose 3 times, or get 9 wins. The farther you get, the better your reward when it ends. I have no clue how the crafting system works. Is there a good place to check out a tutorial? The most I've done with it is turn my extra cards into dust. Basically, you can disenchant a card into dust equal to 1/4 its value. If you click on the crafting button, it'll open the crafting interface, which looks exactly like the normal collection interface except it shows -all- possible cards, and the ones you don't own are greyed out. You can click on any card, and it will show you its cost in dust to create, or how much dust you'll get if you disenchant it, and has buttons for both. It's really very easy once you start looking through it. Speaking of Hearthstone, at BlizzCon they announced that the game will be made for tablets, iOS, and android down the line. I can only imagine what that will do to my productivity. Jesus H. Frostwolf Warlord is so very OP. 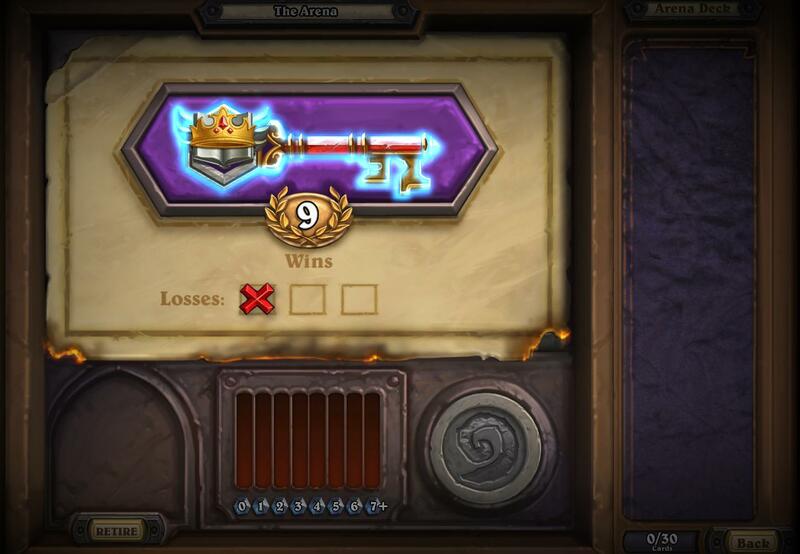 It's really not fair that you can get an up to 8/8 monster on the third round of the game. That's very situational though, and requires you to be able to keep all creatures on the board from the beginning to get it that high. I'm having a ton of fun playing with my Warlock deck right now. It was hard to get used to at first, giving up quite a bit of health for damage, but you can melt some face. In the future, we plan to allow players to play in regions that are outside of their home region. When this happens, you will be able to pick which region you would like to play in. However, the important thing to remember is whenever you decide to change regions, your collection does not transfer over to the new region you would like to play on. On the new region, you will have to start your progress over as if you were a new player to Hearthstone and nothing will carry over in-game. We currently have no plans to allow players to play against other players across regions. WTF? Why? It's a goddamn card game, latency doesn't matter, why go with geofencing? I got a beta key today, hooray! Sweet, gonna try this game out! Have you played blizzard games in the past, and it's been a long time since you did? If so, you might need to clear out the old bnet cache stuff, I had a similar problem but a quick trip to the tech forum cleared it up. Hey, has anyone heard if we get to keep our cards going into retail? I have heard people say we will have a wipe and others saying we get to keep them. Last I heard, no more wipes. I think it was in a blue sticky on the beta forums. No more wipes, all cards you get from here on out will carry over into launch. Yeah it was pretty much stated we keep what we have into Live.